In its ongoing effort to find the best means to help all students learn to read and succeed by the third grade, the Foundation continues to make investments in partnerships with schools other than traditional public schools and systems. Partnerships with private and charter schools have seen tremendous success in student growth and have provided valuable information toward developing literacy best practices. For example, in 2015, the Foundation partially funded a private-public school partnership between Triad Academy at Summit School with teachers and students from Winston-Salem/Forsyth County Schools in North Carolina. Camp Pathfinder, a five-week session held on the Summit School campus, brought together ten public school teachers trained in the Orton-Gillingham reading methodology with thirty struggling students who otherwise would not have been afforded the opportunity to attend such a beneficial camp on a beautiful private school campus. Results from the camp were so positive that the Foundation agreed to fund $50,000 for an expanded camp for ten new teachers and fifty students during the summer of 2016. A private donor also pledged an additional $60,000 in support of the 2016 camp. Over the past five years, the Foundation has also invested more than $125,000 with Brookstone Schools, a small private school serving some of the most needy school children from the downtown Charlotte, North Carolina area. Every year it’s “Straight to the Top” summer learning and enrichment camp has grown and produced great results. In 2016 it will serve approximately 120 children from its school enrollment as well as students from surrounding neighborhoods. The strong success of Brookstone has attracted many funding partners. In fact, in the spring of 2016, the Leon Levine Foundation issued a $150,000 challenge grant to school supporters so that Brookstone might add a second kindergarten class in the fall. The Mebane Foundation pledged an additional $20,000 to help with the challenge portion of that grant. Most recently, the Foundation committed $25,000 to Horizons National; an award-winning, tuition-free, summer academic program serving low-income, public school students on the campuses of independent schools, colleges, and universities across the country. The Horizons partnership with The Oakwood School in Greenville, North Carolina will be the first of its kind in the state. The Foundation hopes to learn from this private school outreach model used by Horizons National, that has shown great success and promise elsewhere in the country. Sixty-five percent of today’s jobs require Science, Technology, Engineering, and Math skills, and 16 of the 30 fastest-growing careers demand substantial math and science education. And this is only the beginning. A STEM education will be essential in the work world of today’s children. The Mebane Foundation believes that it must actively engage students in STEM-related academics and enrichment experiences in order to nurture interest, enthusiasm, and pursuit of STEM careers. We believe that optimum 21st century STEM learning occurs for all students only when optimum 21st century STEM teaching occurs in all classrooms. We believe that we have a profound responsibility to ensure learning for all students by creating, implementing, and supporting innovative and top-quality professional development for all teachers, centering upon inquiry-based methodologies, various technologies for student engagement, integration of STEM curricula across subjects, and the use of community STEM professionals as compelling classroom resources. Our innovative STEM Infusion program, featuring intensive use of computer technology under the supervision of highly trained teachers committed to this education model, offers a marked increase in the percentage of students from all demographic groups successfully completing challenging STEM courses and prepared to pursue post-secondary STEM careers. Mebane Foundation has a rich history of employing and investing in these fundamental STEM principles to design and implement projects which boost student achievement by creating 21st century classroom learning environments taught by top-notch teachers. The Foundation’s focus on creating 21st century learning environments began in 2004 with the Mebane Technology Challenge in Davie County, NC. The Challenge stated that if the county could raise $1.5 million from individuals, companies and civic groups, then the Foundation would contribute $750,000 over a three-year period to add the best educational technology to classrooms in every school across the county. The challenge was met, and and the funds provided SMART Boards, projectors and laptop computers for all but 80 of the school system’s 500 classrooms, plus pre-K classrooms in five of the six elementary schools. As a result, students were visually stimulated and engaged in learning as never before, and teachers, many who were resistant to integrating computers into their lessons, became eager to learn more computer/SMART Board applications. Finally, having technology – and enthusiasm for it – in all classrooms laid the foundation for the innovative professional-development models to come through Foundation initiatives: Mebane Masters and Stem Infusion. Research shows that the most influential variable in student learning in the classroom is the level of expertise and skill of the teacher. Having all of the technology in the world is useless unless you are trained to use it. Seeking to enhance learning through a far more effective use of technology, the Mebane Foundation collaborated with Davie County Schools and Appalachian State University’s Reich College of Education in 2008 to create a 30 month, first-of-its-kind, academic degree program for 15 Davie County teachers. These teachers remained in their Davie County classrooms while pursuing their Master of Arts Degrees in Instructional Technology. The training prepared them to serve as their school’s primary resource for questions about the best and most practical ways to maximize technology’s benefit in the classroom. It was the Foundation’s first look at real-time, teacher-driven, in-house professional development. The student-teacher component became another crucial piece of the Mebane Masters Program. Over five semesters in 2½ years, 60 Appalachian State University student teachers were housed in Davie County, spending their 15-week semester paired with one of the 15 master teachers. This technology-rich environment paired with an innovative spirit created an exciting learning environment for Davie students, student teachers, and master teachers alike. Most of these master teachers remain in Davie County and continue to embrace their professional-development roles. 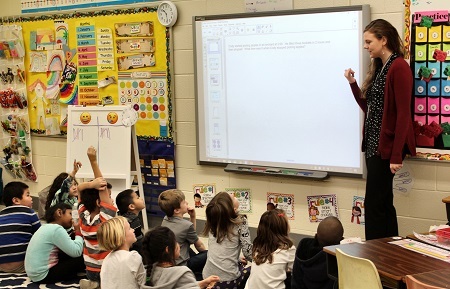 Also, many of the student teachers who rotated through the program decided to teach in the Davie County Schools. Created a powerful, new model for teacher education and professional development. Made it much easier for Davie County Schools to recruit and retain the best teachers. Laid the groundwork for STEM Infusion. Expanding upon the the success of the Mebane Masters program, STEM Infusion facilitated further STEM innovation through the creation of three, 5-member traveling teaching teams that provided training and assistance wherever needed.. Each STEM team was composed of a highly skilled and experienced teacher, a beginning teacher, and three student teachers. These elementary, middle, and high-school teams assisted classroom teachers with creating and implementing engaging STEM lesson plans using technology. In addition, a new website was established by the STEM team to share resources, including lesson plans. End-of-grade results showed improvement in student achievement growth in classrooms where teachers adopted the STEM Infusion approach to teaching and learning. Initiated through its $750,000 challenge grant and a vision for enhanced learning through far more effective use of technology, the Mebane Foundation collaborated with Davie County Schools and Appalachian State University’s Reich College of Education to create a first-of-its-kind academic degree for 15 Davie County teachers and a profoundly innovative and extravagantly successful program of interactive technology they helped implement in 100 percent of the school system’s classrooms. The program, Mebane Masters, has changed the face of education in Davie County, grades K-12, since it was launched in 2008. 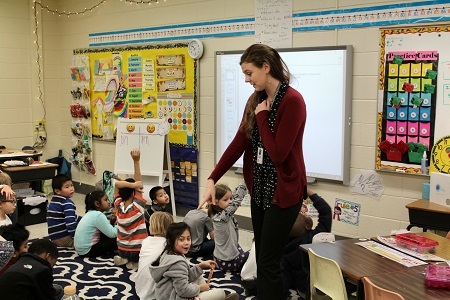 Providing a holistic method of teaching to technology savvy students, Mebane Masters has earned overwhelmingly positive responses from students, teachers, administrators and community. The core of the program was a 30-month partnership between Davie County Schools and the ASU Reich College of Education. The 15 teachers in the program remained in their Davie County classrooms while pursuing their Master of Arts Degrees in Instructional Technology. They acted as the school’s primary resource for their peers when it came to questions about the best and most pragmatic ways to maximize technology’s benefit in the classroom. It was our first look at real-time, teacher-driven, in-house professional development. The student-teacher component became another crucial piece of the Mebane Masters Program. 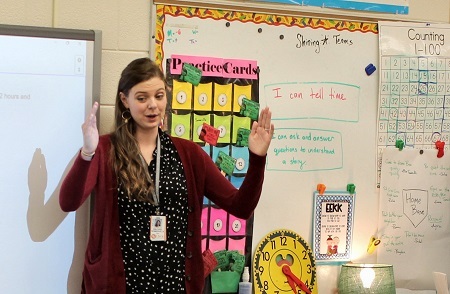 Over five semesters in 2½ years, 60 Appalachian student teachers were housed in Davie County, spending their 15-week semester paired with one of the 15 master teachers. The technology-rich environment laced with a palpable innovative spirit created an intensive learning environment for Davie students, student teachers and master teachers. Most of these master teachers remain in Davie County and embrace their professional-development roles. Also, many of the student teachers who rotated through the program have decided to teach in the Davie County Schools. It is our hope that Mebane Masters Program has created a model for teaching, learning and professional development that can reshape the educational landscape and address many of the issues facing public education in our state and nation. Launched in 2004, the Mebane Technology Challenge was not only delivered cutting-edge technology to every classroom in Davie County Schools, but it also brought the community together to achieve a vitally important common goal – improving education for thousands of children throughout the county while at the same time ensuring the effort would be sustained through ongoing support. In 2004, the Mebane Foundation issued a challenge: If the county could raise $1.5 million from individuals, companies and civic groups, then the Foundation would contribute $750,000 over a three-year period to add the best educational technology to classrooms in every school across the county. By the fall of 2007, without any government/taxpayer funding, the community had raised more than $1.5 million and Mebane Foundation had completed its match. Those funds provided teachers in all but 80 of the school system’s 500 classrooms had SMART Board technology, projectors and laptop computers… plus pre-K classrooms in five of the six elementary schools. Seeing the excitement among students and teachers as well as the enhanced educational environments created by the technology, Davie County Commissioners voted unanimously to spend $1 million to pay for the remaining SMART Boards, six new audio-visual (distant learning) classrooms, a technology rich professional-development hub for training teachers and the last of the six pre-K, technology-enhanced classrooms. By then technology was transforming education for students in every classroom in every school. 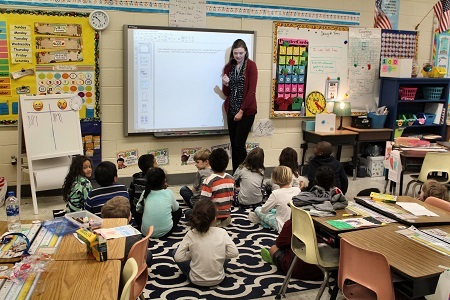 Perhaps the most significant result of the across-the-board SMART Board infusion was the well-documented interactive learning that had taken root across Davie County – and the elimination of virtually all disciplinary problems in classrooms. The children were visually stimulated and engaged in learning as never before. Another positive result was that teachers, many who had resisted integrating computers into their lessons, were buying into the new pedagogy and becoming eager to learn more computer/SMART Board applications. Davie County’s Cooleemee Elementary had an enrollment of 520 students in kindergarten through the fifth grades in February 2009, and 72-73 percent of them were considered “Economically Disadvantaged” (receiving free and reduced-price lunches) by the State of North Carolina. Statistically, students who fall into that category are more likely to be academically at risk. Report card grades and standardized tests confirm that risk. The previous year, Cooleemee Elementary did not make Acceptable Yearly Progress (AYP) in math under the No Child Left Behind federal legislation, and the students struggled to meet local standards as well. From 2009-2011, the Mebane Foundation partnered with Cooleemee Elementary and Davie County Schools to help fund a systematic intervention program featuring diagnostic and prescriptive research-based programs delivered by computer – Waterford software for kindergarten students and Successmaker for the older children. In addition, teachers also employed comprehensive reading intervention strategies using The Hill Center RAP model. Student’s On-Going Achievement in Reading (SOAR) was added during the summer reading program. In each lab, the program coordinator provided continuity, monitored students and provided technical support as needed. She was also responsible for generating and reviewing reports with teachers after every five lessons. 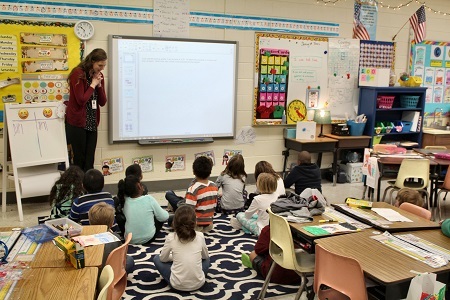 The reports, which provided information about individual students and the entire class, were used to direct the complete intervention strategy, including instructional planning. Successmaker and Waterford reports, including grade-level equivalency, were also sent to parents with quarterly report cards and with progress reports mid-quarter. The frequent assessments provided a variety of helpful data about student progress. The assessments were also prescriptive, offering clear direction about areas needing improvement before end-of-year standardized tests. The summer reading program ran for three weeks and provided three hours of small-group or individual reading instruction each day along with free breakfasts and lunches through Child Nutrition. During the summer, when many students regress in their academic skills, Cooleemee students demonstrated growth that continued into the school year. Each of these programs and interventions provided another layer of support for the students, and each layer offered an opportunity to bring students closer to increased academic achievement and a more promising future. The Summer Reading Program at Cooleemee was a tremendous success! We achieved the initial goals 1) to increase student achievement in this academically-challenged school; and 2) to provide a successful working model that could be implemented throughout the other Davie County elementary schools. Of the 22.8% Hispanic population (105 students) in the school, 13.2% (61 students) were served in the English Language Learners’ program because of a language barrier to their learning. A comparable number, 13.4% (62 students) were served in the Exceptional Children’s program because of learning difficulties. Successmaker, Waterford and other researched based intervention such as Hill RAP or Hill Strategies have been used. Bus transportation for students enabled them to access the Child Nutrition Program of free breakfast and lunch before and after reading instruction. Data generated through assessments given throughout the year has been maintained to track progress. The focus of instruction continues to be for students at-risk in reading, primarily to help them improve comprehension skills. Students’ gains carry over into the regular year from the summer program. We have documented a number of success stories of students connecting in the small groups to produce a more positive, productive attitude carrying over throughout the year. We have also tracked steady gains with many students who have continued to attend the summer camps. For the first two summers, a pre-kindergarten camp has been included during the last 8-9 days of SOAR. This has proven to be very beneficial in preparing those identified as most at-risk to transition more successfully academically and socially into kindergarten, narrowing the gap with those who are more prepared. The Successmaker lab has had a tremendous impact on student learning in the school over the first two years. Benchmarks were raised during the second year, and minimum proficiency level to advance increased from 65% to 80%. The grade-level proficiency benchmark was raised to the next grade level instead of the average required to score proficient on the End-of-Grade tests. Teachers have become more attentive to data generated by Successmaker reports and how it can improve classroom instruction through literacy centers and individualized instruction. The program’s evolving effectiveness and efficiency has captured the interest of others. The school was asked to conduct a workshop for the other five elementary schools in the county focusing on the use of reports available, the additional options that had been developed, and classroom applications. Cooleemee Elementary was also asked to present its system at the North Carolina Title I Conference during the second year. Data provided by the Cumulative Gains Reports continues to indicate students are making progress at and above expected rates. Scheduling for kindergarten and first grade improved in the first year, providing small-group instruction in the classrooms and researched-based instruction in the lab. Teachers wanted access to the media center stations for additional sessions to support students outside the scheduled groups who were significantly below grade level. Reports from Waterford matched indicators from the classroom and provided information that supported classroom instruction as well as parents’ awareness of their children’s progress.